Had another great lunch at the Depot yesterday. The clam chowder was terrific as usual. ( Robert, however, said that he wasn't pleased with the clams therein). Then I had what has become my favorite menu item: the pot roast sammy. On a butter toasted roll goes a pile of really flavorful pot roast, then great, made from scratch gravy is poured over it, and it is topped off with a bunch of french fried onions. It is best eaten, IMO, as an open facer, with the top bun used for sopping up the gravy. To eat it as a sandwich is to invite possible shirt stains. I've been to the Depot 6 or 7 times, and I've enjoyed the pot roast sandwich on 3 of the visits. Seems I tend to stay with a winner. Lunch today was excellent. I had a cheeseburger - cooked perfectly medium. Mrs. Johnny had the clam chowder - which was a delicious comfort on a cold day like today. I promised Annemarie (the host/co-owner) that I would mention they offer free wi-fi. Had lunch at the Depot today. What a cute, friendly place. The turkey/bacon sandwich I had today was top notch. The turkey was fresh-roasted. The server (not the co-owner) very proudly boasted to me that the kitchen roasts it daily. It was served on nice quality whole-grain bread. The bacon was meaty and thick-cut. A couple of minor quibbles: the bread was overbuttered and didn't stay together and the turkey was too cold. I understand the need to keep meat refrigerated but it would have been better all round if it was warmed a bit prior to being put on the sandwich. I can't wait to go back to try something else because this is place is food nostalgia. It's not so much the retro decor, but the idea of a classic American diner making food as it was before the days of frozen food service beef patties and chicken soup out of a can. The ham is cut off the bone. The hash browns (more like American fries, I think) were crispy, and the eggs were gently turned. On a cold morning (especially after an even colder night of drinking gin and eating nothing but oysters), this was the right meal…and a perfect preparation for listening to Dr. Buccini’s excellent paper on eggs and pasta, delivered in a room that dropped precipitously in temperature throughout the morning. Huh. I, too, was at the Depot for lunch today, around 1:30. Even though it took us much longer than it should have to get there (owing to a snap decision to take 55, followed by a jaunt through Cicero) it was well worth the trip. I had the cheeseburger, medium, topped with fried onions per my request. I was astonished to see that the burger was actually medium - usually I order it that way to avoid getting a burnt hockey puck. Next time it'll be medium-well. My husband had the pot roast sandwich, which he ate like a burger, because he is unafraid of stains. We each got an egg cream, vanilla for me, chocolate for him; I preferred the chocolate, unusual for me because I hate chocolate syrup. We saved room for dessert, red velvet cake and doughnuts. Maybe I missed this piece of info earlier in the thread, but the doughnuts are not just homemade, they are made to order. The red velvet sported perfect cream cheese icing. And I do love cream cheese. We talked to the owner for a while, but it wasn't until later that I realized I should have asked if they ever have coconut cream pie on the menu. It is my ultimate diner fantasy to have a meal like that, finished up with a slice of cream pie with real whipped cream. Suzy Creamcheese wrote: Huh. I, too, was at the Depot for lunch today, around 1:30. We saved room for dessert, red velvet cake and doughnuts. I saw those two dishes going out to your booth! Those doughnuts looked amazing! Even though we couldn't possibly eat a dessert after our meal, we got a piece of the Red Velvet cake to go. I thought about looking around and lowing "LTH....LTH...." but the presence of the cops at the counter kind of put a damper on that one. I looked around pretty often at everyone there - who were you? My neighbors and I are optimistically confident that Robert's arrival is the beginning of a turnaround of that stretch of Roosevelt Avenue, not an exception. yes, i know, roosevelt road. i was going to fix that, but it had already been quoted, so left it alone. just chalk it up to my excitement?? kl5 wrote: yes, i know, roosevelt road. When I lived out that way, many years ago, most of the old timers still called it 12th Street. Yeah. Up until it closed, the Parky's on Roosevelt in Berwyn still had a sign up declaring it the "12th street branch". And there are a few other businesses along that stretch referring to it as 12th street still. Breakfast today featured biscuits and gravy with the biscuits made to order. Only took about 10 minutes and was done for anyone ordering b and g. A nice touch to ensure a great plate of food. Wow, biscuits made to order! That's a change since yesterday, when they were fresh within a few hours, but plastic-wrapped and waiting. Still good that way, but fresh-baked would be great. Mike G wrote: Wow, biscuits made to order! That's a change since yesterday, when they were fresh within a few hours, but plastic-wrapped and waiting. Still good that way, but fresh-baked would be great. MikeG, funny thing: when I was there (maybe 30 minutes before you), Robert was actually punching out biscuits that were destined for the oven. Maybe you were served some that he made even earlier, though that seems odd. He probably said "this morning," I took that to mean "when I came in at 6 am," as opposed to "half an hour ago [9:30ish]." I was there for breakfast today as well. I was there around 8:30 and Robert was whipping up a new batch of biscuits as we were ordering, but there were some already made. Robert said that he makes them in small batches (it looked like the ball of dough he was working with was probably going to make a dozen) so that they're always fresh. It sounds like thick hit it at the precisely correct moment, although Robert's treatment of splitting the biscuit, schmearing a good glob of butter on it and putting it face down on the griddle before covering the biscuits in gravy was enough to make me not notice any "age" on the biscuits. The B&G was as has been described and high in the top tier of B&G around town. The grits were good as well and, also due to timing, cooked to order. We were there, too, sitting at the booth directly behind the police officers. Nothing like the sight of five pistols to whet the appetite! 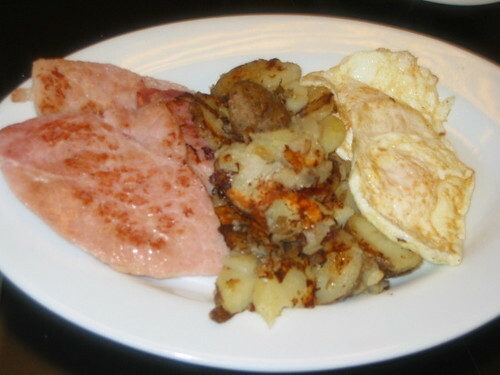 (Our food was terrific: a plate of the apple pancakes, the BLT, a french dip, and eggs over medium with ham off the bone). (Almost forgot the freshly baked slice of red velvet cake). I am going to be a regular customer for sure. And it's good to hear about the biscuits and gravy, as one of my co-diners was sad they weren't on the menu. Mike G wrote: I am posting this on Saturday afternoon because you need to go have these tomorrow morning. Biscuits, as Steve Z mentioned, are made in small batches throughout the morning. Bacon was delicious, though Hammond's ham upthread appears eminently edible. Kilroy might not have been, but I spotted the mark of Z. As good as the biscuits and gravy were, and they were very good, it might have been worth the trek in Sunday mornings -5 degree temps just for our waitresses friendly demeanor and genuine smile. Seebee's name will be on that chalkboard within a day or two! Very tasty doughnut holes, to order, with a pretty good chocolate/coffee sauce. I was impressed by how quickly the place had built up a crowd of neighborhood regulars. It felt like it, and those people, had been there for 20 years. I, too, followed the call to biscuits and gravy. In fact, when I woke up Sunday morning, I had nothing but biscuits and gravy on the brain. Once my co-eater awoke, we headed to the Depot. The place was empty, save for some kids who seemed to belong to a guy who came in and fixed something (not only on a Sunday, but Superbowl Sunday, I might add). The B&G were delicious, but I was also struck by how utterly perfect the "sunny side up" eggs I ordered were. Crispy around the edges, perfectly oozy in the middle. I've sworn to try the doughnuts next time. I'm curious how it is that I still have yet to meet any LTHers in passing, because between Fulton's and this place, we've definitely walked the same paths lately. Another couple came in while we were there, but I feel sheepish about walking up to strangers and, in a conspiratorial whisper, asking, 'You LTH?' Maybe someone should come up with a secret "flash"--a gang sign we can drop discreetly to identify ourselves. Perhaps three taps and a rub of the belly? crrush wrote: I'm curious how it is that I still have yet to meet any LTHers in passing, because between Fulton's and this place, we've definitely walked the same paths lately. Another couple came in while we were there, but I feel sheepish about walking up to strangers and, in a conspiratorial whisper, asking, 'You LTH?' 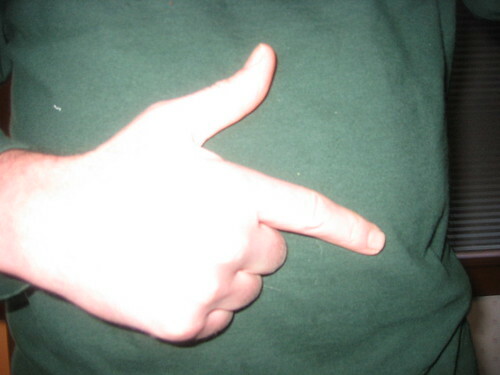 Maybe someone should come up with a secret "flash"--a gang sign we can drop discreetly to identify ourselves. Perhaps three taps and a rub of the belly? Might I suggest an "L" shape formed by the extended thumb and index finger, closed palm facing toward one's body followed by two taps on the belly -- if done very quickly, it would be identifable as an intentional gesture without being so overt as too look too ridiculous. Casual eye contact might also help cement the intent of the communication. There is, of course, one very easy way to recognize LTHers. That's a great idea! I'm going to start carrying a stone crab claw with me everywhere I go. I meant carrying around a nice older Jewish couple from Boca. David Hammond wrote: Might I suggest an "L" shape formed by the extended thumb and index finger, closed palm facing toward one's body followed by two taps on the belly -- if done very quickly, it would be identifable as an intentional gesture without being so overt as too look too ridiculous. Casual eye contact might also help cement the intent of the communication. Incidentally, I was told, very much on the down-low, that the as-yet unidentified illustration is a pot roast sandwich. No matter how much squinting I did, I still couldn't see it. Initially, I thought maybe it was a salad of some sort, but pot roast sandwich? Nuh-uh. Still not seeing it. Does someone have a good picture to post? So I'm fairly new to LTH - but today I needed a place to eat and do some school work, and a diner is perfect for that. So I figured why not kill two birds with one stone and try out the Depot. Well - I did hear at least two other groups from LTH were there at the same time (I didn't try out the hand signal...sorry). I had the pot roast sandwich... which was lovely. And the donuts - which are worth a special trip. And they were really accepting of me simply doing homework (Grad School) in a corner - and even mentioned the free Wi-Fi a couple of times. What can you ask for more? Excellent freshly roasted coffee, good food, and a booth to work in. If it wasn't normally so far out of my regular traffic patterns - I'd be there all the time! French Dip Sandwich (au jus) with Mashed Potatoes and Cole Slaw. Tommorow's Blue Plate Special is Lasagna. While I was eating my lunch, a little bird perched on my shoulder and told me that the President of Lettuce Entertain You Enterprises Inc. stopped in the other night. Tried the lasagna, which may be this diner's nod to a more-or-less vegetarian-type Blue Plate Special (there could be some meat stock in the sauce, though I can't say for sure). What I found most appealing about this rendition of the dish (which I almost never order in any restaurant) is the airiness of the ricotta -- it's actually fluffy -- with the layers of cheese standing up to the sheets of pasta and sauce (which is also relatively light). Seems like just about every time I go to the Depot, there's some person or group of people from the neighborhood, talking the place up. It was much like my visit to southside Koda last year; tables on both sides of us, filled with locals, thrilled to have a new neighborhood restaurant that promised to rejuvenate the community, a source of pride and identity. On this board, our usual focus is on the food of a restaurant, of course, because most good restaurants distinguish themselves as sources of good food. This diner seems to promise more than just an excellent platter of chow...and I find that very interesting. We visited for breakfast on Sunday at around 9am. We were the only patrons for most of our meal. Near the end a gentleman came in and sat at the counter. We started with the donuts. They were delicious. Good without the chocolate-mocha dip. Amazing with it. Everything else was good, but like everyone else, I wish the biscuits were fluffier. What stood out - The ham and the potatoes. Nothing fancy, just spot on juicy, not too salty ham and perfectly cooked potatoes and onions. Nice butter flavor, but not greasy. Nice onion flavor, but not burnt. All around good food and a good value.